When determining the best service and cost solutions for a given supply chain, integrating fleet and for-hire capacity into a holistic, integrated solution is oftentimes the best practice. To do this, it’s important to approach this challenge dynamically. 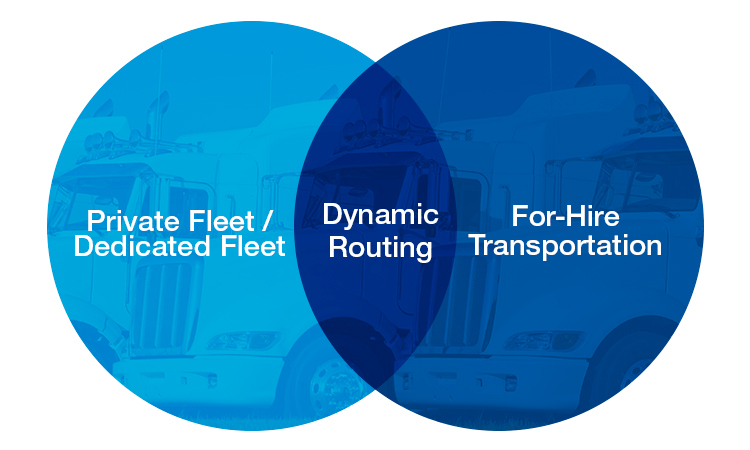 While fixed routing guides for fleets is common, using fleets flexibly based on the availability of backhauls, driver hours available, and other constraints, coupled with the flexible capacity of for-hire carriers, often results in increased fleet utilization, reduction of total costs, and better overall delivery metrics. Even if you don’t have a fleet of your own, fleet-like service is available in the for-hire market if it is properly engineered and managed. Dedicated and Private Fleets are oftentimes sized based on averages, but this typically results in a poorly sized fleet causing higher total transportation costs in the form of minimum guarantees or too much transportation purchased. Appropriately sizing fleets is critical. Using actual demand and historical data allows modeling and fleet sizing based on such things as actual market conditions and seasonality. Expert logistics engineering teams for fleet design coupled with today’s advanced optimization tools – a strong TMS (Transportation Management System) for routing both fleet and for-hire capacity holistically – is the perfect combination. In order to appropriately size your fleet, it’s essential to use a dynamic fleet sizing model for Private and Dedicated Fleets using historical seasonality and shipment data, for-hire carrier rates and capacity, and Dedicated or Private Fleet costs. While the concept of Dedicated Fleets – capacity guaranteed with an outside carrier in a take-or-pay contractual arrangement – is well understood in our industry, Private Fleets – fleets operated by the shipper themselves with similar constraints as Dedicated Fleets – benefit similarly from dynamic sizing, dynamic optimization, and high utilization techniques. Historical shipping data often highlights seasonality, weekly, monthly or quarterly variances in demand. This historical data, combined with macro environment changes in the marketplace, are all inputs to proper fleet sizing. Understanding your customers’ specific needs and markets, changes in manufacturing locations or strategies, marketing campaigns, and competitor changes can result in demand changes. Approaching your transportation network with a flexible demand model that can rapidly adjust to these changes – including a realistic view of the costs of too much fleet, an understanding of the flexibility of expanding and contracting fleet size in response to demand changes, and an acknowledgment of the for-hire market – are all considerations when both designing and managing your fleet and for-hire capacity. Best practice is to use dynamic optimization for each shipment when assigning a Dedicated or Private Fleet asset or a for-hire carrier. This results in the total lowest transportation cost with the best service outcome. As a Dedicated Fleet provider, a for-hire carrier, and a logistics provider, KAG Logistics sees the complexities, challenges and benefits of optimizing shipments every day across fleets and for-hire capacity. With our intimate knowledge, KAG Logistics sizes fleets differently – we understand the market, especially for liquid bulk fleets. Our brokerage arm can find backhauls for fleets where products and timing allow. Using both contracted and brokerage capacity to augment fleets as well as leveraging the expertise of KAG Capacity Solutions to find coverage for shipments that your fleet or network can’t handle, our expertise in the for-hire market provides unparalleled coverage and service. It’s important to acknowledge that your supply chain is never static. While “Static Routing” is often used for Dedicated and Private Fleets and is a simple way to operate, restricting fleets to a subset of the total shipments available greatly reduces fleet effectiveness. To combat this, use a “Dynamic Routing” strategy in both design and execution to solve for all available shipments, and to determine which should go on a Private or Dedicated Fleet, and which should go on a for-hire carrier. It is the best-in-class way to manage a supply chain. By pre-engineering strategic solutions to determine fleet size and for-hire capacity strategies, as well as holistically planning daily, weekly and monthly, your supply chain will be dynamically optimized for the long haul.